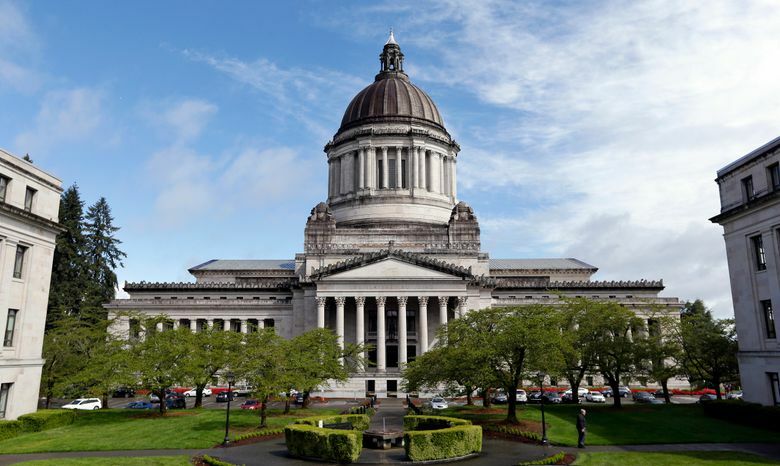 The Washington Legislature faces a Friday deadline on state budget and education negotiations. Much of their work has been done in secret: Citizens will get little time to review any agreement. OLYMPIA — Rest those eyes, people: You’ll likely have little time to pore over the fine print of the two most important agreements coming out of the state Capitol this year. Since late March, work on a two-year state budget and a school-funding plan required by the state Supreme Court has gone on behind closed doors, directed by a handful of tight-lipped legislators. The talks are a striking contrast to the budget negotiations of 2015, when each party publicly released detailed compromise proposals throughout the overtime sessions. Lawmakers have until the end of Friday to pass a new budget and win Gov. Jay Inslee’s signature, or much of the state government will shut down beginning Saturday. More than 30,000 government workers have already been given layoff notices as agencies prepare to close. In addition, legislators are trying to reach a final agreement in the yearslong quest to fulfill the state Supreme Court’s McCleary decision, which declared Washington was violating its own Constitution by underfunding the K-12 school system. Legislators are also engaged in closed-door negotiations over a proposed paid family-leave program for private-sector workers and bills to address rural-water use. The budget and McCleary negotiations involve billions of taxpayer dollars, discussions about new revenue and reviews of existing government policy and programs. As of Monday evening, no agreement had been publicly announced on either plan. “We know that negotiators met all weekend and have been working hard to get this done,” Inslee spokeswoman Tara Lee wrote in an email Monday. Once a deal is reached, it will take a couple days to iron out details and draft the legislation. At this pace, Washington residents will have only a few days — maybe even less than 24 hours — to review the details before Friday’s deadline, when the current budget expires. In 2015, lawmakers and Inslee announced a budget agreement on June 27, but details weren’t released for another day or two. However, the public knew where negotiations were heading because of the earlier releases of compromise proposals. “You can’t say that what they’re doing is illegal, but it’s still wrong,” said Toby Nixon, president of the Washington Coalition for Open Government. “We should absolutely have the right to observe the entire deliberative process,” said Nixon, a former Republican state representative and current member of the Kirkland City Council. Lawmakers say the secret negotiations are necessary. The talks between the Democratic-held House and GOP-controlled Senate over the budget and education funding are sensitive, and could easily collapse. Figuring out how Washington state will fund teacher and other school-worker salaries, as required by the 2012 McCleary decision, adds complexity that didn’t exist in 2015. Currently, a big chunk of those salaries is paid by school districts with local property taxes. The 2015 fight over the $38.2 billion budget set a record for the most days lawmakers had ever spent in session. To reach agreement this time, the handful of budget and education negotiators must corral rank-and-file lawmakers on both ends of the political spectrum toward any eventual compromise. “We’re trying to find a way to yes that meets the requirements of our individual caucuses,” said Sen. John Braun, of Centralia, who is chief GOP budget writer. The public negotiations of 2015 ultimately weren’t very helpful to lawmakers, according to Braun and House Majority Leader Pat Sullivan, D-Covington. “I don’t think it brought anybody closer together, it caused more finger-pointing,” Sullivan said. Both parties earlier this year released proposed budget plans to fund government and pay for schools. The Democratic plan proposed billions of dollars in new revenue, including through a capital-gains tax and an increase in part of Washington’s business-and-occupation tax. The GOP plan, meanwhile, featured what’s known as a property-tax “levy swap.” It would establish a uniform statewide property tax rate to fund schools, raising property taxes in places like Seattle and Bellevue while lowing them in other areas. Neither Braun nor Sullivan would discuss details of what may be in an eventual agreement. But Braun on Friday did say, “Very few things go outside of that box” of ideas. “There are no surprises here,” he added. The Olympia rumor mill in recent days has speculated that the education-funding proposal would include an expansion of online sales-tax collections and a smaller version of the GOP’s property-tax plan. Inslee earlier this month indicated both of those approaches could be part of a final deal. Any education-funding compromise, which would impact each of Washington’s school districts, would have to be run through an analysis before being finalized. Inslee on Monday was scheduled to meet with Sullivan and Democratic House Speaker Frank Chopp of Seattle to discuss negotiations, according to the governor’s office. The governor also had a separate meeting Monday scheduled with Senate Majority Leader Mark Schoesler, R-Ritzville, and Sen. Randi Becker, R-Eatonville. With any agreement at this point coming so close to the June 30 deadline, Inslee’s office will have little time to review the details. “If this goes as well as expected, we’re going to have two days to read” a budget bill that is customarily hundreds of pages long, said David Schumacher, director of the state Office of Financial Management. In those situations, “Sometimes we find ourselves vetoing things that maybe, if we had time to talk to people, we didn’t need to, but under the crunch we have to,” Schumacher said.